28 Commonwealth is located on the south side of Commonwealth, between Arlington and Berkeley, with 26 Commonwealth to the east and 30 Commonwealth to the west. Click here for an index to the deeds for 28 Commonwealth. 28 Commonwealth was built as the home of George Tyler Bigelow and his wife Anna Smith (Miller) Bigelow. George Bigelow purchased the land from Samuel Hooper on May 2, 1860. They previously had lived at 126 Tremont. They also maintained a home in Quincy. The July 7, 1860, contract for building 28 Commonwealth was filed with the Suffolk County Deeds Registry and includes details about the materials and construction of the house. Click here for an abstract and partial transcription of the contract. George Bigelow served in the Massachusetts House of Representatives (1840-1846) and State Senate (1847-1848). In 1848, he was appointed associate Justice of the Court of Common Pleas, in 1850 a full Justice, and in 1860 Chief Justice. In 1868, he retired from the bench and became actuary for the Massachusetts Hospital Life Insurance Company. 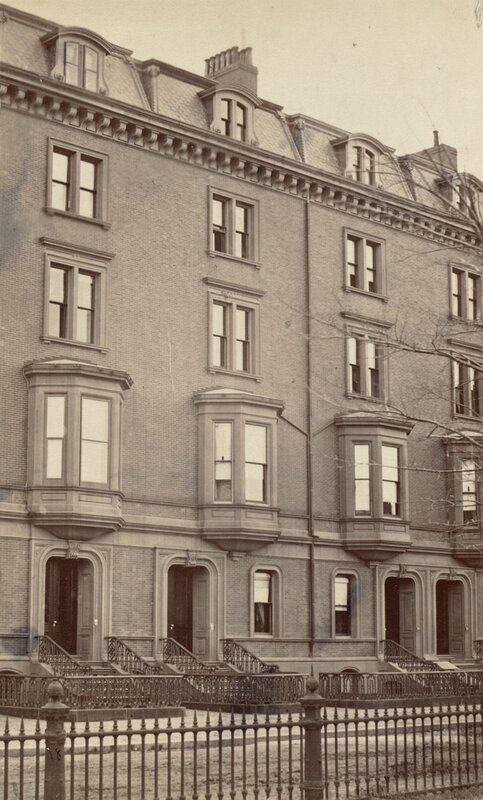 George and Anna Bigelow lived at 28 Commonwealth until his death in April of 1878. After his death, Anna Bigelow moved to their home in Quincy. The house was not listed in the 1879 Blue Book. On February 21, 1879, 28 Commonwealth was purchased from Anna Bigelow by Dr. Henry Harris Anthony Beach, a physician and surgeon. He and his wife, Alice (Mandell) Beach, made it their home and he also maintained his medical offices there. They previously had lived (and he had maintained his offices) at 104 Boylston. Alice Beach died in July of 1880. Henry Beach continued to live at 28 Commonwealth and, in December of 1885, he married again, to Amy Marcy Cheney. Amy Cheney was a pianist and composer. A child prodigy, she began composing music at age four and performing publicly at age seven. She studied in Boston and made her professional debut in 1883, at age sixteen. After her marriage to Henry Beach, she focused on composition. Click here for an external link to Women’s Philharmonic Advocacy’s website on Amy Beach. Henry and Amy Beach continued to live at 28 Commonwealth until his death in June of 1910. After his death in 1910, Amy Beach embarked on a three year tour of Europe and then resumed her career as a performer. Between tours, she lived in New York City and in Centerville on Cape Code. She is credited with composing more than 150 works ranging from chamber and orchestral works to church music and songs. 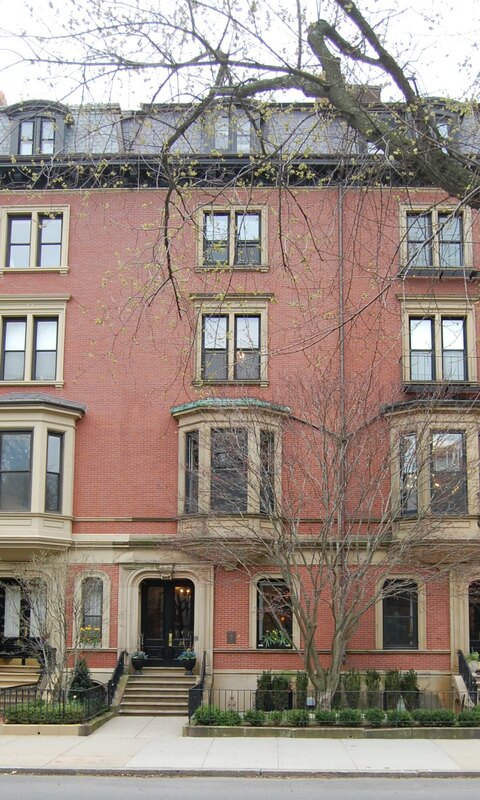 She continued to own 28 Commonwealth, renting it out as both a residence and for medical offices. By 1911, 28 Commonwealth was the medical office of Dr. Farrar Crane Cobb, a physician and Superintendent of the Massachusetts Eye and Ear Infirmary. He had maintained his offices at 317 Marlborough in 1910. He and his wife, Frances W. (McMurray) Cobb, lived at 5 Brimmer Street. Dr. Cobb continued to maintain his office at 28 Commonwealth in 1918, but had moved it to 419 Boylston by 1920. Longer-term residents listed in the Blue Books at 28 Commonwealth during this same period included Henry C. Tuttle (from about 1913 through about 1915); Charles C. Newcomb, a produce merchant, and his brother, George Dillingham Newcomb, treasurer of an iron foundry (from about 1914 through about 1915; they previously had lived at 118 Commonwealth); and Dr. Henry C. Marble (from about 1915 through about 1917). 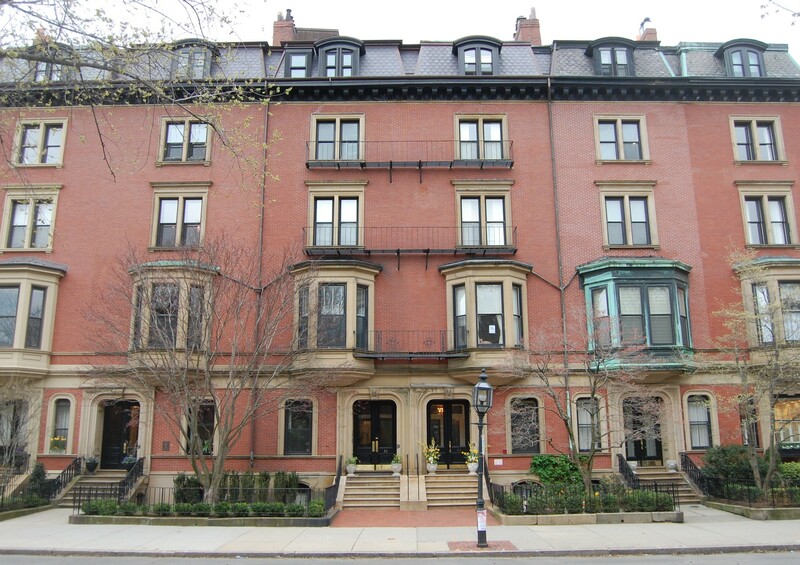 By the 1918-1919 winter season, 28 Commonwealth was the home of Arthur Gilpatrick and his wife, Mina A. (Barron) Gilpatrick. At the time of the 1920 US Census, he was the manager of a restaurant, and he and his wife maintained a lodging house at 28 Commonwealth. Among the lodgers at 28 Commonwealth was Madame Maria Kedrina, a ballet dancer and teacher, who also maintained her studio at the house in 1922. On December 27, 1924, 28 Commonwealth was purchased from Amy Beach by the estate of Adelaide (Weir) Root Manning. The Gilpatricks continued to live there during the 1925-1926 winter season, but moved soon thereafter to 4 Commonwealth. 28 Commonwealth became the home of Adelaide Root Manning’s daughter, Mrs. Pauline (Root) Otis Danielson, the widow of William Sigourney Otis and of John DeForest Danielson. She previously had lived at 4 Commonwealth, where the Gilpatricks moved. Pauline Danielson also maintained a home, Pound Farm, in Medford. She continued to live at 28 Commonwealth until her death in June of 1946. On April 8, 1947, the estate of Adelaide Root Manning transferred 28 Commonwealth to the estate of Pauline Danielsen. On the same day, real estate dealer Thomas J. Diab purchased the property from Pauline Danielson’s estate, and the next day it was acquired from Thomas J. Diab by Lenore Y. (Vermorel) Veo, the wife of Dr. Charles Kenneth Veo, a dentist. Earlier that year, they had lived on Nantucket and he had maintained his dental office at 122 Commonwealth. In October of 1947, Lenore Veo filed for (and subsequently received) permission to convert 28 Commonwealth from a single-family dwelling into a single-family dwelling and dentist’s office. They continued to live (and he to maintain his dental office) there until about 1949. On June 10, 1949, 28 Commonwealth was acquired from Leonore Veo by Sydney Sinclair Abrams, an engineer. He lived there with his parents, Hyman Ely Abrams (Abramowitz), a printer, and Frances (Rosenthal) Abrams. They previously had lived at 93 Revere. On March 1, 1950, the Boston Globe reported that Sydney Abrams had formed American Cinema Enterprises, with plans to make films in Hingham, utilizing shipyard buildings as sound studios. On January 3, 1951, Sydney Abrams transferred 28 Commonwealth to his mother. The Abramses continued to live at 28 Commonwealth in 1951. On July 30, 1951, 28 Commonwealth was acquired from Frances Abrams by Edward Joseph Fox, a lawyer. He was a widower and previously had lived at the Hotel Victoria at 271 Dartmouth. His unmarried sisters, Helen (Nellie) E. Fox, a clerk, and Agnes G. Fox, a teacher, lived with him. They previously had lived at 88 Mt. Vernon. Edward Fox died in December of 1956. 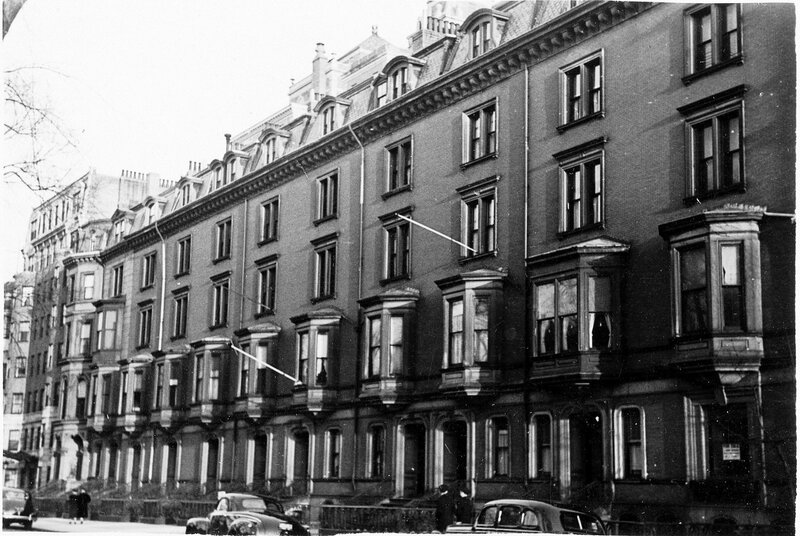 Agnes and Helen Fox continued to live at 28 Commonwealth until about 1962. On August 15, 1962, 28 Commonwealth was purchased from Helen and Agnes Fox and their brother, James A. Fox, by the Wendell Realty Corporation. By 1963, 28 Commonwealth was the home of Ronald G. Havelock and his wife, Mary C. Havelock. They continued to live there in 1964. On October 25, 1965, the property was acquired by Chamberlayne School and Chamberlayne Junior College, for use as a dormitory. Chamberlayne went bankrupt in the mid-1970s, and on June 15, 1975, 28 Commonwealth was transferred to Bernard P. Rome, the trustee for their bankruptcy. On November 14, 975, 28 Commonwealth was purchased from Bernard Rome by Peter K. Gearhart, Nicholas Gervasi, and William Boyajian, general partners in Commonwealth Limited. 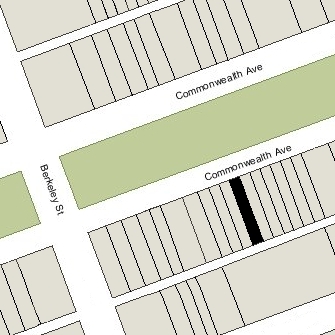 On November 17, 1975, Commonwealth Limited filed for (and subsequently received) permission to convert the property into five apartments, and on September 14, 1976, it converted the apartments into five condominium units, the 28 Commonwealth Avenue Condominium..